Bovespa stock-index futures dropped as economists estimate the central bank will keep interest rates at a higher level for longer than previously estimated, and China increased banks’ reserve requirements to cool inflation in Brazil’s biggest trading partner. Oil company OGX Petroleo & Gas Participacoes SA may be active after it was cut to “hold” from “buy” at Banco Santander SA. Power distributor CPFL Energia SA (CPFE3) may move after O Estado de S.Paulo reported it’s in talks to buy Empresa de Investimento em Energias Renovaveis SA. The newspaper didn’t say where it got the information. Bovespa stock-index futures dropped 1.2 percent to 67,125 at 8:10 a.m. New York time. The measure tumbled 3 percent last week, the biggest decline since the five days ended Jan. 28. The real weakened 0.6 percent to 1.5857 per U.S. dollar. Economists covering the Brazilian economy raised their forecast for the benchmark interest rate at the end of 2012 to 11.75 percent, up from a week-earlier forecast of 11.5 percent, according to an April 15 central bank survey of about 100 economists published today. They held their forecast for the so- called Selic rate at 12.25 percent by the end of this year. Inflation in the next 12 months will be 5.42 percent, up from a 5.41 percent estimate a week ago. Economists also increased their forecast for this year’s inflation to 6.29 percent, from 6.26 percent a week earlier, the survey showed. OGX, the oil company controlled by billionaire Eike Batista, reported 10.8 billion barrels of total crude and natural-gas resources, the second-most for a Brazilian-based company, according to a regulatory filing April 15. Banco do Brasil SA (BBAS3), Latin America’s biggest bank by assets, may be active after Valor Economico reported it plans to open 60 branches of Banco Patagonia SA in Argentina by 2014. The newspaper didn’t say where it obtained the information. Lojas Americanas SA (LAME4), Brazil’s biggest discount retailer, may move after it said in a regulatory filing it sold 500 million reais of promissory notes. Spanish casino operator Codere SA (CDR) is studying plans to list shares of the company in Brazil, Mexico or the U.S., Madrid- based newspaper Expansion reported, citing Chief Executive Officer Jose Antonio Martinez Sampedro. The Bovespa is down 3.8 percent this year through last week as homebuilders and banks declined on concern inflation will limit growth, overshadowing a rally in telecom shares. The index trades at 10.6 times analysts’ earnings estimates, according to weekly data compiled by Bloomberg. That compares to a ratio of 14.2 for the Shanghai Composite Index, 7.3 for Russia’s Micex, and 15.1 for India’s Sensex. 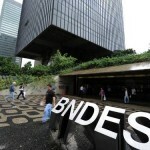 Investors pulled 3.3 billion reais from Latin America’s biggest equity market this year through April 13, data from the Sao Paulo exchange show.